Palgrave Macmillan‘s new City Branding book includes my chapter on city branding with new green spaces. Amazon’s says it’s in stock, but I am still waiting for the publisher to send me a copy. There are many chapters I am looking forward to reading, including Roland Kelts’ chapter on Tokyo (@rolandkelts). Many thanks to Keith Dinnie for editing this volume. Newsweek Japan published my article about how Tokyo gardening turns public space into social space. 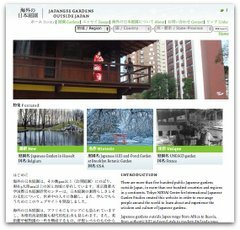 The Tokyo Eye column allows Japanese to see how foreigners view and experience Tokyo, and I was asked to write in a very personal voice about how I experience living in Tokyo and why green space matters. I will post an English version soon. 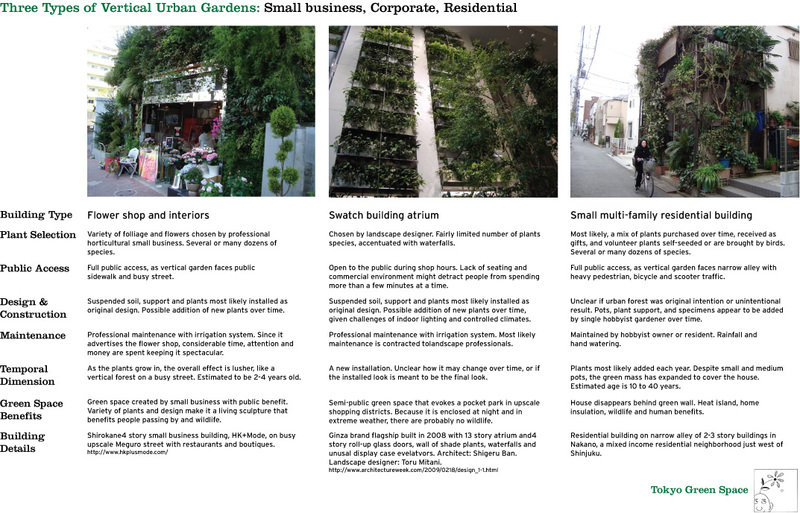 The chart above (click for larger size) is a first effort to analyze three types of vertical urban gardens: small business, corporate and residential. I am interested in plant selection, public access, design and construction, maintenance, temporal dimension, and green space benefits. As I collect more images and thoughts about green urban space, I will post more of these photo analyses. Please let me know what you think.